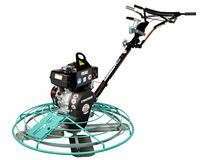 The EDCO T46B-9H Walk-Behind Trowel #85200 with Honda engine is a solid built trowel machine built for the pros. Allen Eng made this trowel for EDCO. The Multiquip/Whiteman J36H55 Power Trowel is a 4-blade, 36″, Honda GX160, 60-115 blade. Concrete Power Trowels for high performance, quality finishes: The Wacker Neuson CT 48-8A is complete with a Honda engine. Handle sold separately.